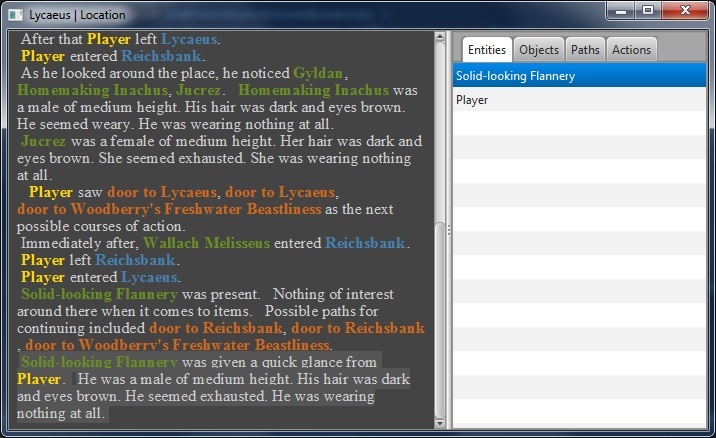 Procedurally generated textual RPG adventure game. Have you ever wondered how an AI-driven game of Dungeons & Dragons mixed with a modern first-person RPG would look like? Well this is it! Forget about shiny graphics and high frame rates. Instead, dive deep into your imagination guided by a colourfully described world rich with detail. The ideal way to play this would be on a phone. 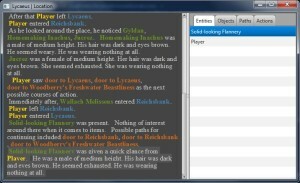 Instead of reading a fantasy book, you could live your own adventure in an interactive story. There is no need for fast reactions, you can take your time (as it is basically a turn-based game), just like with a book. But you get a new and individual story every time you play. Status: basic prototype done, not really playable.